The fillet knives have become much of a necessity to be a permanent part of our domestic kitchen drawers and they are quite productive for commercial needs as well. They have got the potential of chopping through fish just as you are moving a knife through butter. One such classical example of this type of equipment is the Rapala Cordless Fillet Knife. It has a variety of unique features which you wouldn’t see as a package in any other similar tool. The tool has an excellent first impression which is more of a quality, technologically advanced and versatile knife to do the job for which it is manufactured. The Rapala has produced a few other cordless versions as well, but this one is the most complete, concise and a top quality tool with not much of the negative sides to worry about. The handle of the equipment is ergonomic and quite tempting which pushes you to just go on and on with the filleting job that you are doing. The handle is precisely designed to give you good control on your hand while moving the tool through the meat and it does a great job in this aspect. The blade length is 7 inches which is good enough to employ it for a variety of fish sizes with ease. It is a battery powered unit with lithium ion batteries which are best known in the business to give the longs standby time. In this case, you will have the opportunity of using the tool consistently for 80 long minutes with a single charge. There is no element of lessening in the power once it is nearing the 80 minute battery standby operation mark. You will get a very consistent speed and the much needed torque while you shift from one piece cut to the other. The battery just takes less than 120 minutes to give you a full charge that lasts 80minutes. Then, there is a low memory effect feature as well which considerably enhances the number of charge or discharge cycles which eventually facilitates the user with a much longer better life. The package comes with a charger as well. There are a couple of things which you might attribute with its shortcomings. Cleaning or sanitizing the knife is a bit of an issue due to its onboard technological features. Water penetration of the system can be a bit of an issue that can ruin the device. Knife could have been even better if it had a slight bit of flex in its blade which it is missing. 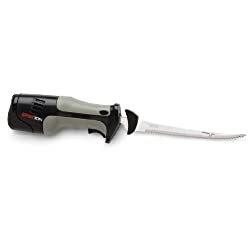 The void of having no specific filleting tool in your kitchen can be well filled using this versatile fillet knife. It is cordless, battery operated with a sharp resourceful blade which is tailor-made for doing the filleting tasks. Washing can be a concern, but can be controlled if you are careful in handling it during a wash.
Bottom line: It would be a great choice having a discounted price of about $68.